I have been using MTA solely for my transportation since 2003. One cause for the decline in ridership is partially due to the fact that your operators allow many people on for free. I see it every day of the week. Another issue is that there are many that would not even consider riding a bus. I drive for a limo service and have suggested to people I drive who work in Burbank and live in Pasadena to try out your line 501 but they will not take a bus ever. Buses will always take extra time because of many reasons. Every day I see people who wait until they get on the bus to get their money to pay for the fare or dig through their purse for their TAP card even though they have been waiting 20 minutes for the bus. Buses have traffic and streetlights to contend with. Trying to speed up something that will not go extremely fast might have an adverse effect. I would love to give more input directly but you schedule the public meetings when I am at work so feel free to contact me if you want any other ideas. The busiest arterial bus routes- local, rapid, express, etc.- should be prioritized for this “hybrid” plan. Another suggestion, so many senior citizens are left without transportation and have to take a taxi which is very expensive for them. Manhattan Beach has a wonderful Dial A Ride program which many residence of their city use, especially their senior citizens. I wish Metro would examine their program and put this type of service available for more seniors in the Los Angeles Area. Perhaps, Metro could coordinate with cities to pay part of the price if they are interested. That’s a good point and I’ll forward your comment to the folks upstairs. FWIW, a lot of funding for transportation in cities around L.A. County comes through Metro and its various funding programs, including a portion of each of the four sales taxes approved by L.A. County voters. I absolutely agree with you that Dial-A-Ride programs are generally very popular in the places that have them. Some cities make them available for all over a certain age, others for folks with disabilities. Metro has a couple of on-demand pilot programs. 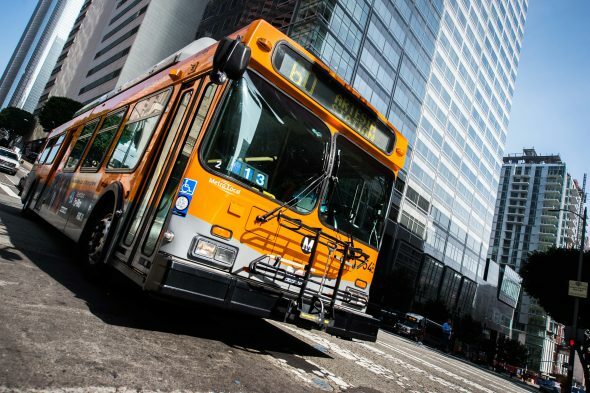 The VIA rides started in January from three stations (Artesia, El Monte and NoHo) and cost just a $1.75 (with a TAP card) and the agency hopes to launch its Microtransit program later in the year. Not quite the same as dial-a-ride but similar — on-demand rides for a low price. I’ve commented on this in the purview of NextGen, but I’ll say it again: for the suburbs that are perennially underserved b/c of low ridership, a program like VIA or a partnership with rideshare/bikeshare can completely replace scheduled (or non-rush hour) service. The 78 runs past my house in Arcadia, but that bus is pretty empty east of Rosemead, and the mythical service that is the 268 (once an hour, ends at 8 pm) might as well not exist. If I can get a P2P pickup within say, 15 minutes of arranging for a ride, I would never need to back the car out of the driveway. Some of this could be variable-fare to encourage behavior. If your trip ends or begins at a transit station (El Monte), then you get charged the local fare; if not, then you get charged the Lyft/Uber fare; or just run shuttle service to/from transit stations. Personally I love the VIA concept, I just live outside the service area and the 268 is a nonstarter for me because I get home late. Yeah, I’ve occasionally ridden the portion of lines 108 and 110 on the westside, between Lincoln Blvd and Culver City, and they’re almost empty. If the Culver City Bus can get people to the same place for a lower price, Metro can’t compete. What’s often confused me is the gap in the bus network between Playa Vista and Playa Del Rey, where lines 110 and 115 each have endpoints, with nothing between the two. 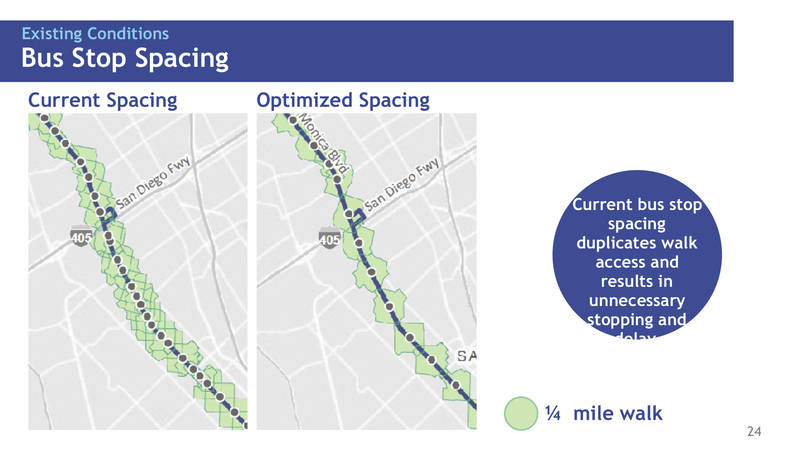 Although I doubt that connecting such a small stretch would get you any significant ridership, it at least gives riders more options. If there are other small gaps like this, it might be worth looking into. The cost and added time for covering such distances wouldn’t be huge. I remembered one question from the survey I took, whether I prefer easier transfer or a better direct service (I can’t remember exactly what the question is, but something like this). Most people chose for better direct service. I guess people prefer direct service over easier transfer is because under the current system transfer is unbearable. Would that mean transfer is something Metro should really focus on? I think Jarrett Walker once said public transit is about networking. To my understanding, “network” means transfer. I have a cheap suggestion regarding the transfer issue (you can ignore it if it appears to be non-sense to you). Take a look at the bus schedules, we have buses with headway of 10 minutes, 12-13 minutes, 15 minutes, 18 minutes, 20 minutes, 22 minutes, 25 minutes, 30 minutes, 35 minutes, 40 minutes, 45 minutes, 50 minutes, and 60 minutes. Can we have simpler headway patterns? For example, 10 minutes, 15 minutes, 30 minutes, and 60 minutes. It would be easier for passengers to memorize the schedule, and more important, it would be easier for passengers to plan transfer. Oh please bring back the rapid express if you’re gonna still be adding even more stops to the rapid lines Metro. 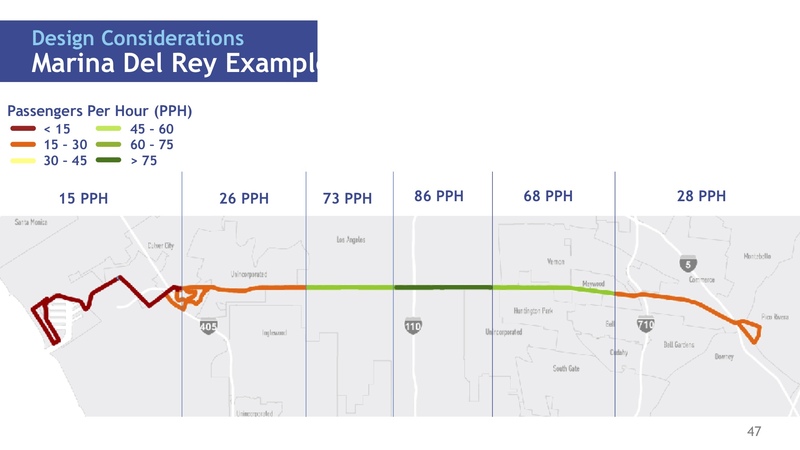 These routes have been getting slower over the years and no, more traffic isn’t the reason, otherwise explain why these routes are still slow after 9pm. Just, even if the Rapid Express were to ever be brought back, experiment with it right, don’t just dump a bunch of buses every 5 min during rush hour and then disappear during the day, that and the 940 idea is what essentially killed what could have been the only other alternative to rail. Add a decent frequency throughout the day, and figure out the appropriate frequency at the time of day. If the only gain out of all this is an enhancement of the 9-5 commute this whole thing is going to fail from the start. I don’t mind a hybrid option but; it depends on where this hybrid option would be best effective. This won’t be effective on some routes. Again, while during rush hour this may be a good alternative, being forced to ride a bus with more stops after 9pm would be even more of a drag than it is now. I think the 920 should be brought back- but I forget why it was cancelled. I do recall reading something about buses on Wilshire being impacted by poor street conditions. We need a regional, all-day bus service that can take streets or freeways. Out in the Valley, there’s plans for a BRT-line for the Northeast Valley to CSUN. The strongest candidate for a route follows Roscoe Boulevard. They can try building the ridership by introducing a route that goes from CSUN to North Hollywood via Reseda, Roscoe, and the 170. That freeway is fairly open and rush hour could be navigable still. 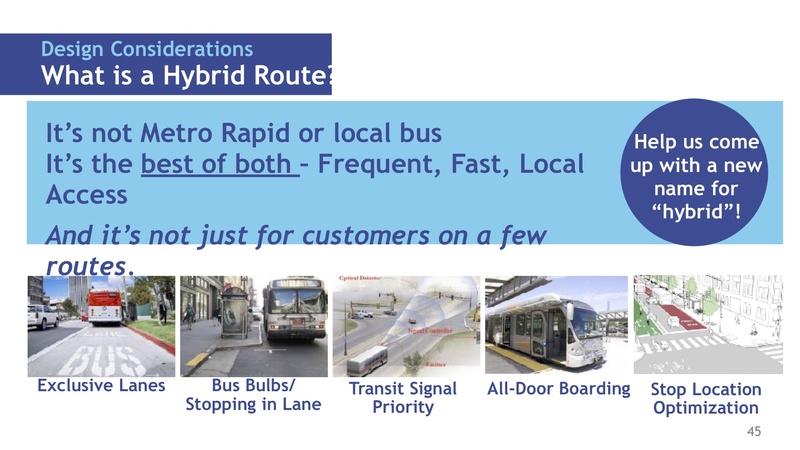 A few suggestions for what you can call the hybrid routes: upgraded routes or priority routes. The latter applies because you’re prioritizing the bus over single passenger vehicles. I think all door boarding will work great, it is a feature on the Metro Silver Line that quickly onboards the crowd. I would really like to see a tracking system like GPS that is used for Uber and Lyft. This will allow people to schedule much more efficiently for bus trips. If the goal is to increase ridership then perhaps there should also be an incentive like reduced fare prices for couples and groups. Another possible suggestion would be the addition of more bike racks on buses. With investments toward LA River trails there should be consideration for more cyclists to fit on the bus as well. 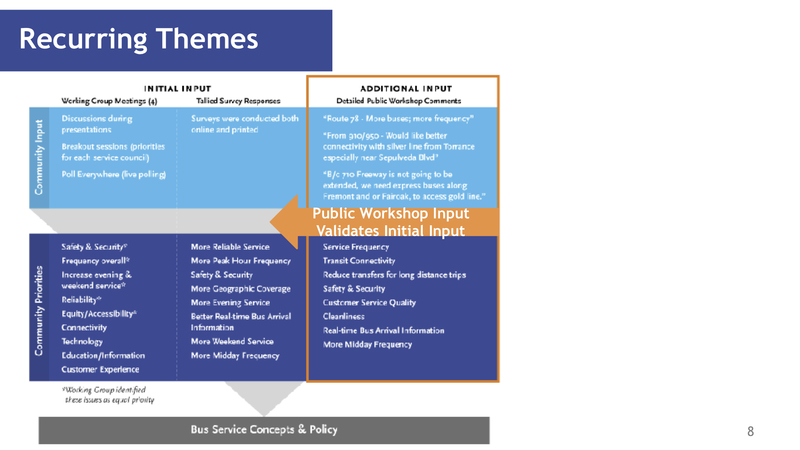 Bus frequency is the most important factor in improving the bus system. Period. Having all day 10 minute service or better, 7 days a week, on major arterials like La Brea, Ventura, etc. is the only way people are going to view riding the bus as an important part of their travel patterns or for making transfers. This should be obvious but given Metro’s current bus schedules, this doesnt appear to the the case. There are often intervals of 25 to 30 minutes or more depending on time of day. The 212 on La Brea is an example. It’s honestly baffling. It makes using transit infeasible time wise to get to most places outside of walking distance from a rail line or major bus line that just happens to have decent headways, which are far and few.